Antoinette of Bourbon was the formidable matriarch of the Guise family in sixteenth century France. She had many children who were instrumental in international politics as well as in religious life including her daughter Mary of Guise, Queen of Scotland. Her grand-daughter was Mary Queen of Scots. Antoinette lived to the ripe old age of eighty-nine and the reason we know so much about her is many of her letters survive to this day. Antoinette of Bourbon-Vendôme was born December 25, 1493 at Chateau de Ham, Picardy, France. Her father was Francis, Count of Vendôme and her mother was Mary of Luxembourg, Countess of St. Pol. We don’t know much about her childhood but she would have received the education of a young woman of her status for the time. We definitely know she could read and write due to her extensive letters. She was a descendant of the thirteenth century Saint King Louis IX of France. She was described as sturdy with dark red hair, fine blue eyes, aquiline features and a vibrant manner. She was also a very devout Catholic. The Guise were a powerful French noble family with estates scattered across northern and eastern France. The main residence was in the Champagne region at Joinville. Claude, Count of Guise was a military hero at age nineteen and a personal friend of the French king. In 1510, he was offered the hand of Renée, the younger daughter of King Louis XII, but he refused. He had already met Antoinette and fallen in love with her. Antoinette came from a good family and had a moderate dowry. In the summer of 1513, Antoinette and Claude were married in the church of St. Paul in Paris. King Louis XII and his son-in-law, the future King Francis I attended the ceremony. Antoinette and Claude then went to live at Bar-le-Duc near Nancy. In September of 1515, Claude fought in the Battle of Marignano and nearly died. In November of 1515, Antoinette gave birth to the first of her many children. She was named Marie. Antoinette’s mother Mary of Luxembourg and Claude’s mother Philippa of Guelders were both in attendance for the birth of Mary and became her godmothers. When Claude had recovered from his battle wounds, he returned home to his wife and his new baby daughter. Antoinette’s second child and first son Francis was born at Bar-le-Duc in 1519. When Claude’s mother Philippa retired to the convent of the Poor Clares in December of 1519, the Guise family moved from Bar-le-Duc to the Chateau of Joinville. It was a beautiful home on the River Marne with a chapel and cemetery, lovely gardens, vineyards and orchards. There were one hundred servants in the castle. Claude was often away and relied on Antoinette to administer the household and estate. She was very successful at her tasks, raising enough money for Claude’s court obligations with enough left over to expand and improve their home. King Francis I created the title of Duke of Guise and bestowed it on Claude in 1528. We don’t know how many miscarriages or stillbirths Antoinette suffered but she did deliver twelve children. All but two survived infancy which was unusual for the time. We have already mentioned Mary and Francis. The rest of Antoinette’s children were born at Joinville. Francis succeeded his father as the second Duke of Guise and was a Catholic leader and lieutenant general of the kingdom of France. Louise was born in 1520 and married Charles II de Croy, Duke of Arschot. 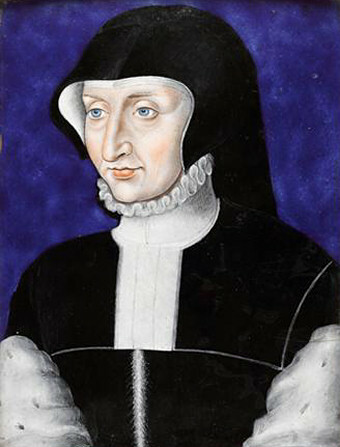 Daughter Renée was born in 1522 and became Abbess of St. Peter in Reims. Son Charles, born in 1524, was Cardinal of Lorraine and Archbishop of Reims. 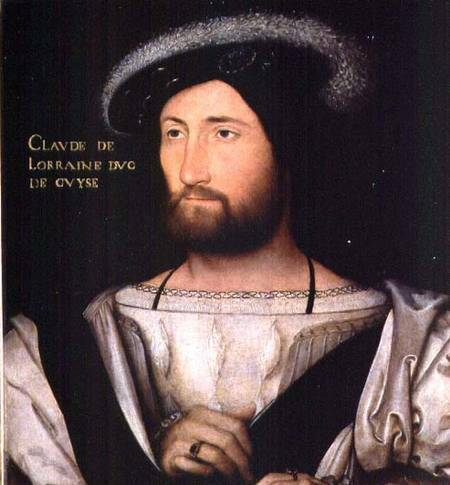 Claude, born in 1526 was Duke of Aumale. Louis, born in 1527 was Cardinal of Guise, Bishop of Metz and Archbishop of Sens. Two sons, Philippe and Pierre died young. A daughter, also named Antoinette was born in 1531 and became Abbess of Faremoutiers. Francis, born in 1534 became Grand Prior of the Order of Malta and son René II, born in 1536, was the Marquis d’Elbeuf and French ambassador to Scotland. In August of 1534, Antoinette’s eldest daughter Mary was married to the Duc de Longueville and she had her first child, a son named Francis in 1535. The Duc de Longueville died, probably of smallpox in June of 1537. Mary was pregnant when her husband died and Antoinette joined her when her second son Louis was born in August. Louis did not live long. King Francis I was pushing for Mary to marry King James V of Scotland, who had recently lost his wife, Madeleine of Valois. Mary relied on Antoinette’s advice during the negotiations for this marriage which were finalized. When Mary left for Scotland, Antoinette took her young grandson Francis to Joinville to be brought up with her other children. Mary made Antoinette the administrator of her Longueville estates. While Mary of Guise was Queen of Scotland, she relied heavily on the advice of her mother. There are many letters back and forth between France and Scotland. Antoinette gave Mary kindly guidance in household and maternal matters, passing along news about the family and French political affairs. Her letters mention Mary’s young son Francis many times keeping her informed of his condition as he suffered from ill health. Antoinette seemed to have relied on the realization of her ambitions through her children and grandchildren. She instructed and guided them with her letters. During the wars of religion in France, her family led the Catholic League. Even the French King Francis viewed Antoinette with admiration. When Mary of Guise gave birth to her daughter, known as Mary Queen of Scots in December of 1542, Antoinette took on a strong role in her upbringing. 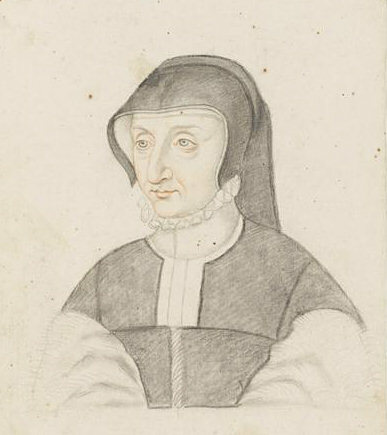 Her first influence was through her counsel of Mary of Guise. When James V died two weeks after his daughter was born, Mary of Guise took over as Queen Regent. In August of 1548, Mary of Guise negotiated to send her young daughter to France to be brought up at court and to marry the Dauphin Francis. Antoinette met her grand-daughter when she landed in France and they travelled together to the royal nursery at St. Germain-en-Laye. It is in one of Antoinette’s letters that we have the first description of a young Mary Queen of Scots. In a letter to one of her sons, she describes the Scots Queen as pretty and intelligent. She mentions her auburn hair and fine complexion, delicate and white. She says Mary’s face is well formed and she moved with grace. In April of 1550, Antoinette’s husband, Claude died. Antoinette truly was now head of the family and remained so until her death. In September of that same year, Mary of Guise travelled from Scotland to France to gain support for her regency from King Henri II. She was ecstatic to be reunited with her daughter and her mother for a short visit. When Mary Queen of Scots was fifteen and the terms of her marriage to the Dauphin were being discussed, Mary of Guise named Antoinette as her representative in the negotiations. Antoinette in turn relied on her sons, especially the Cardinal of Lorraine, to look out for the family interests. Mary Queen of Scots and her husband Francis were King and Queen of France for only a year and a half when Francis died of an abscess in his ear in December of 1560. Mary relied on her grandmother for consolation. Mary of Guise died in Scotland in June of 1560 and named Antoinette executor of her will along with her brother. Mary Queen of Scots returned to Scotland to rule in her own right and made two disastrous marriages which Antoinette disapproved of. When Mary was forced to abdicate and was in trouble, Antoinette refused to help her. Antoinette continued her dominance as head of the family for many years. She was relied on greatly by her children and grandchildren for political, household and personal advice. She always dressed in black and surrounded herself with objects that would be needed for her own funeral. She kept her own coffin in the gallery that led to the chapel for Mass, always strong in her faith in the Catholic Church. She was widely known for her prudent charity. Antoinette died at Joinville on January 20, 1583. She had outlived all her children except the Abbess Renée. Mary Queen of Scots was to be executed in England four years later. How sad she never helped her Grand daughter Queen Mary !! How are you related to Queen Mary ?? Henrietta Tiarks the Dowager Duchess of Bedford has had a coffin made and keeps in her bedroom. Must be something the aristocracy do! A long and very child-filled life! She looks a good humoured but determined lady, from her portrait. Although I’m not sure about surrounding herself with objects that would be needed at her funeral?! Interesting to read her description of Mary, Queen of Scots. I’d always imagined Mary to be dark-haired. A great post, thank you! Fascinating story, Susan! Perhaps an inane comment but – to read about a person dying from an infection always brings home the true wonder of medical knowledge, which we often take for granted. Any woman who lives into her eighties in those contrary times really has an outstanding genetic makeup. Another ‘if only’ – but if Francis had not died of infection, Scotland’s history would have been very different! Agreed diaspora52! Antoinette came from sturdy stock, especially with bearing all those children. I think the intervals between the births helped. And yes, it would be a whole different story if Francis II had lived. Interesting to think about. Thank you for reading! Very interesting post, is no often that you hear that a person have 89 years in those days, and she was a very intelligent person, great post!!!! Thank you Princess. Yes, she did live a long time! A woman ahead of her time. So educated, bright, and involved. Very interesting blog.